Addictive! Crisp and mouthwatering with punchy aromas of apples and pears, and zesty acidity. Aromas of espresso, violets and black licorice with a flavorful and long finish. This Middle Ridge Signataure Meritage is a wonderfully complex wine. It has luscious dark cherry aromas with a light floral note, and a beautiful finish with lingering tannins. 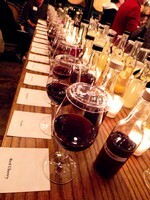 Did you know that smell – not taste – is the human sense that defines the overall flavor of wine? The unfortunate thing is that so many people are unsure of themselves when it comes to identifying aromas in wine and developing an understanding of what they enjoy. In fact, they’re downright uncomfortable with the whole experience. That’s one of the reasons I created the Middle Ridge Signature Aroma Table. 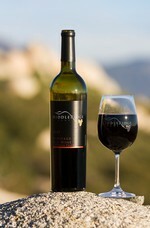 Have you tried our 2010 Meritage yet? If not, be sure to grab a bottle and share it friends. It was aged for 39 months in French oak. Yep, that’s a long time! And the result is a beautiful, rich wine with lots of ripe plum and juicy blackberry aromas that morph into cherries. We call it our yum-yum juice, and the judges seem to think so, too. It received a Gold Medal at the 2014 Sommelier Challenge and another at the 2014 Long Beach Grand Cru. Cheers!